ARE YOU READY TO RRRRRRRRRRRRRRRRRRRRRRRRRRRRRRRUMBLE!!!?????? Guns and Robots is a free to play third person shooter being published and developed by Masthead Studios. Players will choose from a slew of weapons, customize their robots with parts, and move across free-roaming environments unleashing hell on their opponents! Today, I got to speak with Orlin of Masthead Studios about their upcoming title, Guns and Robots. OnRPG: Hello! Introduce yourself to readers. Orlin: Hello, my name is Orlin Doutskinov and I’m Guns And Robots project team leader. OnRPG: What’s the story behind Guns and Robots? Orlin: The idea for Guns and Robots was born in 2011 when we participated in internal competition for a game concept. Everyone liked the game prototype and we started development immediately. We wanted to make a fun free to play game, which will appeal to the crowds with high degree of character customization and many different battle environments. Unity engine was chosen for the project due to the easy learning curve, proven technology and possibility for cross platform development. The first arena – The Old West was just the beginning. We made concepts for many different arenas, which will be seen in 2013 as the game is being updated. OnRPG: How does character customization affect gameplay? Orlin: Character customization, or more accurate robot creation affects gameplay in many aspects. Players build up their robots from the ground, choosing carefully different parts and creating unique modules to fit their gameplay style. If a player likes “Tanks”, he can create heavy modules with more durability and weapons with more firepower, which will make his robot move slower, with a slower weapon fire rate, but the damage it inflicts will be devastating. Vice versa, light robots are fast, relying on speed and weapons accuracy. And most of all, the current “robot creation system” we developed, gives the players literally unlimited combinations of parts and modules, so that every player can create his own unique killing machine that fits exactly to his own gameplay style. OnRPG: What other interesting features are players able to experience that differs Guns and Robots from other games? Orlin: GAR is still a work in progress, and there is much to be done. However, our focus is over the weapons and devices. Every weapon combination will be unique and funny, with its perks and drawbacks. I’ll give you a little secret…there is an elephant gun in our to-do list, that will shoot…elephants. There are many weird and extremely funny weapons in GAR. Same counts for the devices. 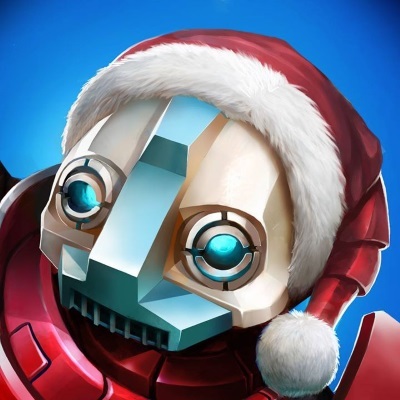 Devices in GAR will be like unique abilities in other games, but they will give the robots, funny and at the same time deadly abilities not seen in other games. OnRPG: What’s the difference between someone who spends money in the cash shop and someone who doesn’t? Orlin: We are trying to make a fine balance in GAR, a balance where players will count on their own skills just as much as on their robot builds. But I think I know what the point of this question is… 🙂 and the answer is no, the game will NOT be “pay to win” type. Every part in the shop will be available just for in-game currency (credits) and players will win credits while fighting, so a good fight will bring a player more credits that he can spend in the shop and buy any item he wants. 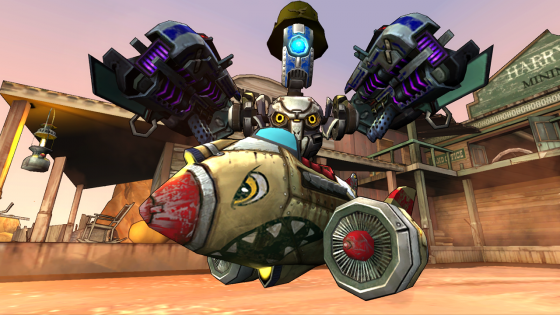 OnRPG: What modes and mini-games are in Guns and Robots? Orlin: GAR will start with one classic mode “team death match”. And soon we will add other modes such as “capture the flag”, “race”, “free for all death match”. Mini-games in GAR will be part of the garage experience that players build over time. Like an upgrade, players will be able to buy different 80’s style game consoles from the shop, each containing a couple of old classic mini-games. Also there will be short but extremely funny single player missions. OnRPG: What type of graphic style will be used? Is there anything special about the art style? Is there any styles or games that your team gained inspiration from? Orlin: We are trying to make the game look as funny and weird as possible, leaning more towards a cartoonish look rather than realism.. There are many movies that inspire us – ALF, Wall-E, The Book of Eli, Il buono, il brutto, il cattivo, Pale Rider and so on. Some of the games we looked to for inspiration are CounterStrike, Quake, Robot Odyssey, The Incredible Machines, Robot Arena and so on. OnRPG: What major changes in development has the game seen from the beginning of development until now? Orlin: Well…the game evolves constantly while we develop it. Actually in the beginning GAR was more like a strategy game. Robot Creation was the interaction part and fighting was more like programming the robot to fight in different ways and watch the results on screen. We decided that this may be a bit boring and added the more dynamic shooter style battles. OnRPG: How has the Unity Engine helped your team create the game? Orlin: Unity is a simple and yet powerful engine that well deserves its reputation. Its well made editor and interface helps the artists focus on their actual work instead of fighting with the software environment. In the past we had a bitter experience with other engines, so we learned our lesson. OnRPG: What type of events will be available in-game past release? Orlin: Organized tournaments, holiday events and new map presentations are just some of the events that will be organized by us. Our focus will be on the community and we would like to keep people engaged in the evolving world of Guns and Robots. OnRPG: Guns and Robots is currently in testing stages. What valuable feedback has the community provided so far? Orlin: The community feedback during our closed beta has been very valuable to us. Most of the issues have been fixed and many suggestions for improving the gameplay were taken into account. We would like to work with our community the same way in the future like it was during the beta stages. The Guns and Robots future development will be a process, which will evolve the community to a great extent. OnRPG: What future expansions/major updates can we see in the future? Orlin: Lots and lots of new and unique robot parts, which means many new weapons and robots combinations, also new arenas are coming very soon. Different game modes, an interactive tutorial, single player missions…and tons of funny stuff. We will also work on a browser version of the game. OnRPG: When can we expect to see the game launch officially? Orlin: The question is easy – when the game is ready. We have announced a release by the end of this year, which will be an open beta release with working cash shop. Accounts and items will be protected and will stay in the game for all future versions. OnRPG: Is there anything else you would like to add? Orlin: We would like to thank our fans for the tremendous support that we have received during the Closed Beta. We will do our best to add the features that our community wants and make GUNS and ROBOTS a fun and enjoyable experience for the fans of online shooters! OnRPG: Thank you so much for your time, Orlin!